This Ayurvedic confectionery is prepared according to the original recipe, ie with ghee instead of butter. The traditional name for Laddu in Ayurveda is " Modak " which means a preparation that makes the inner body happy. It was traditionally used to feed pilgrims. The pilgrims were given upon arrival at the holy sites laddus to supply quick energy to the exhausted body and the other hand to strengthen the spirit of the experience of meditation and prayer. In Ayurveda laddus are considered foods that promote " Jathar - Agni " ( the digestive fire in the stomach ). The toasted chickpea flour is a significant source of high-quality protein, and is recommended especially for children and lactating mothers. 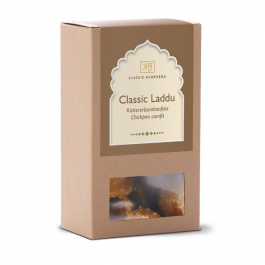 From sweet spicy delights of organic ginger balls to the delicious sweetness of Ayurvedic Laddu. There is as sweet treat for everyone's taste. Amla Natur has been producing natural Ayurvedic products since 1998 and we are proud to offer a selected range to our customers. All these products are packaged and shipped in accordance with strict purity laws and traditional Ayurvedic manufacturing process. This Organic Ayurvedic confectionery is prepared according to the original recipe, ie with ghee instead of butter. 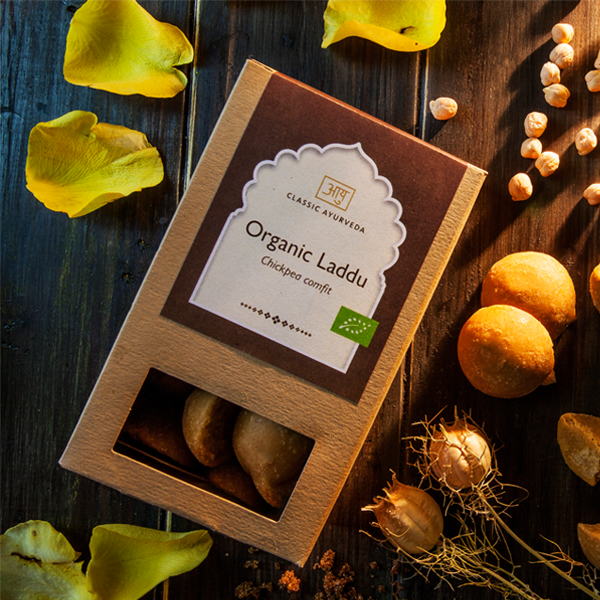 The traditional name for Laddu in Ayurveda is " Modak " which means a preparation that makes the inner body happy. It was traditionally used to feed pilgrims. The pilgrims were given upon arrival at the holy sites laddus to supply quick energy to the exhausted body and the other hand to strengthen the spirit of the experience of meditation and prayer. In Ayurveda laddus are considered foods that promote " Jathar - Agni " ( the digestive fire in the stomach ). The toasted chickpea flour is a significant source of high-quality protein, and is recommended especially for children and lactating mothers. Organic, vegetarian, peanut free, gluten free, lactose free.